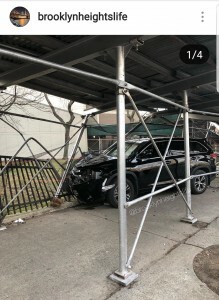 This past Tuesday, a livery car jumped the curb on Cadman Plaza West, barreled onto the sidewalk, and took down a section of scaffolding and fencing in front of 101 Clark St. We read about it first on Brooklyn Heights Life’s instagram. 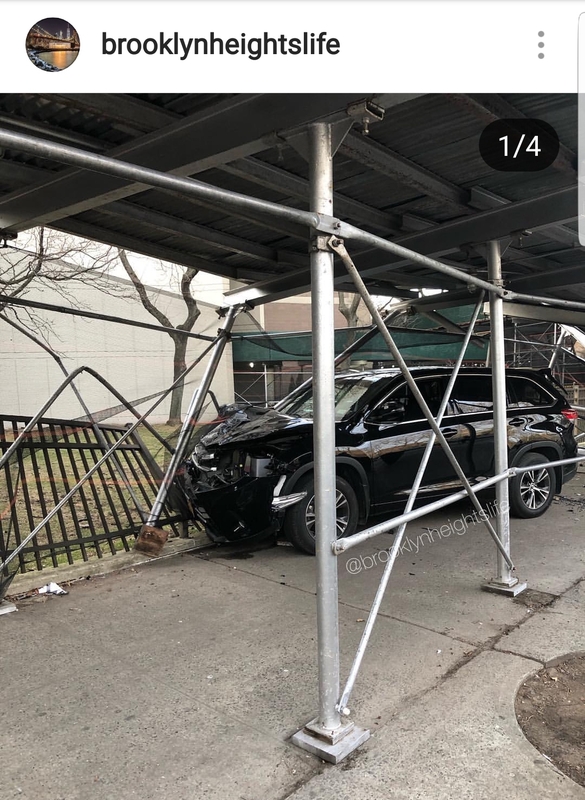 Todd Maisel of the Brooklyn Eagle also reported on the incident on Tuesday. According to the Brooklyn Eagle report, a livery cab driver suffered a “medical emergency” around 2:30 p.m. and lost control of his Toyota Highlander, narrowly missing pedestrians and parked cars. The driver was taken to the hospital. About 10 minutes later, students from area schools and their caretakers would have been walking home after dismissal on that very sidewalk. Thankfully, no one other than the driver was hurt. 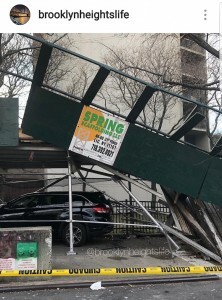 Photos, courtesy of Brooklyn Heights Life, of the immediate aftermath are below. The lead photo was taken the day after as workers repaired the scaffold and fence. A robot car? A car possessed by Satan? Otherwise, it was a driver. Say the word. D-r-i-v-e-r.